My talk was centred around how we are applying Lean Startup beyond the idea and how we are trying to change behaviours to think this way. Craig Strong at Lean Day London 2014 (Lean Day London 2014) from NeoInnovate on Vimeo. I have included the slides below from my presentation. On one of the slides where I wanted to combat change I referenced the inspiring book “Change or Die” by Alan Deutschman. My point in doing so was to reference the challenge on changing behaviours. One of the key questions in this books is “What is it that prevents 90% of heart patients from changing their lifestyle after bypass operations?”. My reference to this is that if you can expect behavioural resistance when people are faced with the most extreme case “end of life”, asking people to change behaviours in an organisation is not enough. Changing behaviours takes more than “support”, you need actions. Actions from the top and through every part of the organisation. This requires significant effort and engagement. 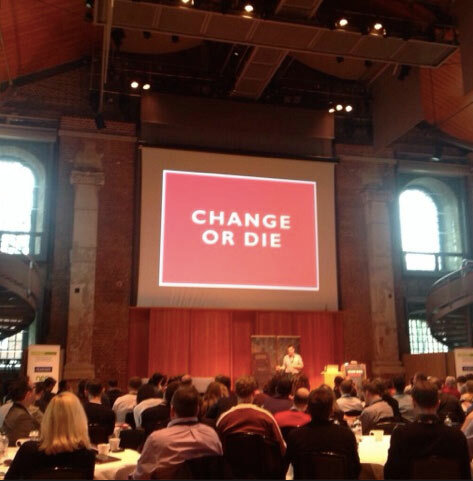 What was amusing about this slide is that, when people photographed and tweeted myself on stage in front of the message “Change or Die”, for anyone not at the conference, this can be taken the wrong way. This was not a comment on the company, but a coaching approach to change for any organisation to consider. The topic of #leandaylondon: how do we shift our culture of delivery into a culture of learning?